The so-called war on drugs has always been and will always be something of a work in progress. While the reality on the ground has changed radically in recent years, the system is a lot slower to change than voters, state legislatures, and science. According to a recent article in the Boston Globe, the Chief of Police in Gloucester, Massachusetts, recently made international headlines when he announced that opiate addicts (heroin, oxycontin, etc.) would no longer face arrest if they came to the police department looking for help. 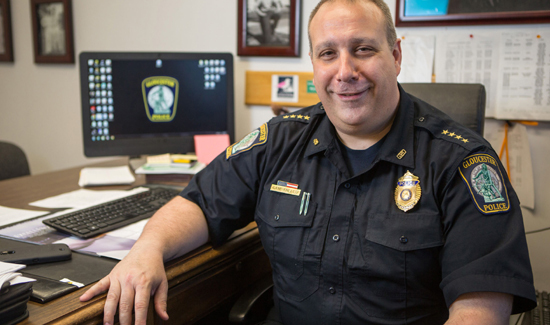 Gloucester Police Chief Leonard Campanello announced in a Facebook post on May 4 that his department was no longer going to treat opiate addiction as a crime and instead take a public-health approach that has worked so effectively elsewhere—particularly in Portugal. But while the landscape is changing quickly regarding drug use and abuse from a cultural perspective, the criminal justice system moves at a much slower pace. In a letter sent after the Chief’s announcement, Essex District Attorney Jonathan W. Blodgett told the chief that he doesn’t have the authority to promise addicts they won’t be arrested if they show up at the station. “While I applaud the general idea of your proposal, an explicit promise not to charge a person who unlawfully possesses drugs may amount to a charging promise that you lack legal authority to make, and on which a drug offender may not be able to rely,” he wrote. Blodgett’s spokeswoman, Carrie Kimball-Monahan, said it’s part of the D.A.’s job to make the chief aware of potential legal issues. Even if Chief Campanello’s pilot program gets shut down by prosecutors, he knows he’s already had an impact. “We’ve already accomplished a lot just by raising the dialogue,” Campanello said. Basically what we’re seeing here is a generational and cultural divide between those that consider drug addiction a public health issue rather than solely from the perspective of the criminal justice system. Ed. Note: Campenello’s courage to try something different because the old ways weren’t working has been of tremendous interest, globally, since this article appeared in a recent issue of American Police Beat. This story originally appeared in the July 2015 issue of American Police Beat. To subscribe (just $12 for 12 issues), CLICK HERE.